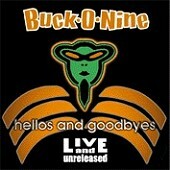 San Diego's premiere ska-punk band Buck-O-Nine may have been dropped by mega-indie TVT after ska-punk bottomed out, but they didn't allow that to put a stop to the band. Frontman Jon Pebsworth started his own label, Off Ramp Records, and took a live concert from Japan, added some unreleased demos, and gave fans some more catchy pop-punk-ska to enjoy while the decision on whether or not the band is going to call it quits is being decided. Though currently on a hiatus (though playing a few shows here and there in their hometown only), Hellos & Goodbyes is an appropriate set-up for a (hopefully) forthcoming Buck-O-Nine studio album. Such live stapes as "Round Kid", "Who Are They? ", "Calling In Sick", "Irish Drinking Song", and "My Town" have never sounded more loose and alive. What will become of the band is undecided. In the meantime, enjoy this twenty-track collection of nearly sixty minutes of fast pop music backed by ska and punk galore. I'll give it a B.